I realize this has nothing to do with my typical subject matter but as you know as I get closer to a trade show I do look for nice segues to help me discuss the show. For example, next week, ITEXPO will be held in Los Angeles and coincidentally about an hour or so ago, Kanye West was arrested in Los Angeles. So coming to ITEXPO can not only be good for your career and help you supply your users with a better IP communications experience, you can come to the show in the city where Kanye West was actually arrested. If you come to the show via LAX, you can actually visit the airport and perhaps gate where Mr. West -- famous for the song Gold Digger and Stronger among others -- was handcuffed and taken away. With any luck -- being LA and all -- you may get to see other celebrities arrested on your way to the show as well. If you do -- be sure to drop me a line. Silliness aside -- we are all looking forward to seeing you next week in LA. iPod Touch: Your Next Office Phone? Recently at a launch event, Steve Jobs had a less than earth-shattering presentation where it seems the news of his health was more interesting to most reporters than the products being rolled out. Having said that, there was apparently huge news unveiled at the show if you are a VoIP-head like me. You see the new iPod can do VoIP because it has an extra wire connected to the headphone jack. Do you remember in 1994 I predicted in Internet Telephony Magazine that Apple would come out with something called a VoIPod? Well I got the name wrong but the concept is still the same -- the new iPods can do do VoIP which means there is a chance these devices will become primary phones for college students and others who are in areas where there is ubiquitous WiFi. Another application of course is in corporations where iPods could become primary phones for workers. ITExpo is arguably the largest gathering of the VoIP industry. The conference and expo is a great place for the industry to gather, network and exchange ideas about the industry. 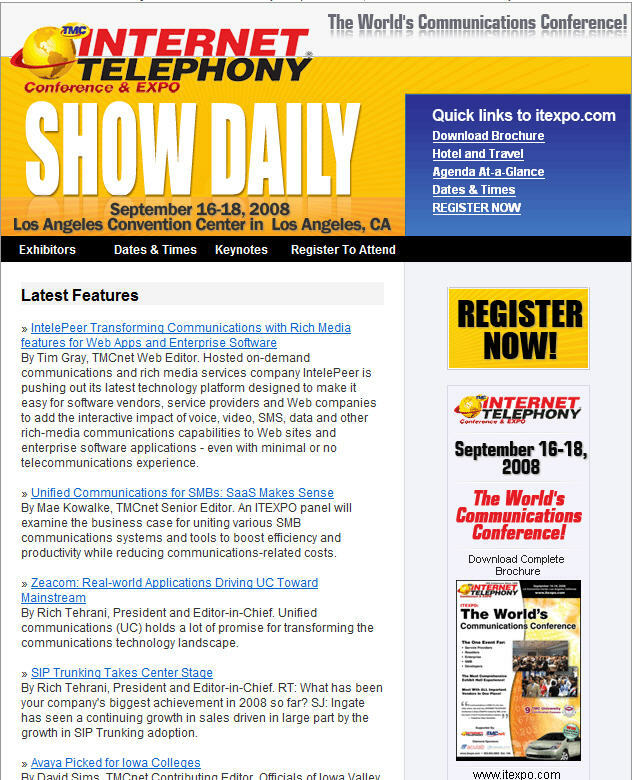 As the founder of ITEXPO, it's been a long road since we first launched ITEXPO in 1999, but my team has worked very hard to make ITEXPO the premiere communications event in the industry. Currently this show is the only one in the world we know of which attracts resellers, service providers and business decision makers. It has truly become the gathering place of the communications industry and we are busy this week putting the final touches on what we think will be the best show we have ever held. Remember the show is next week -- September 16-18 in the Los Angeles Convention Center -- West Hall. Ari I hope to see you at the show and the same goes for all of my readers. The Carterfone ruling is what allowed the AT&T network to be opened up to competition and basically was the result of AT&T trying to stop a company from adding a device which was acoustically not electrically to their network. The 1968 Federal Communications Commission allowed the Carterfone and other devices to be connected directly to the AT&T network, as long as they did not cause damage to the system. This ruling (13 F.C.C.2d 420) created the possibility of selling devices that could connect to the phone system using a protective coupler, and opened the market to customer owned equipment. Many companies including Skype have tried to apply this ruling to the wireless market and changing the practice of bundling service and device with long-term contracts consisting of early-termination penalties. I actually thought this matter was over. But today I came across a press release from The Phoenix Center which says that if the FCC were to regulate the way the mobile industry operates, consumers would lose out. Their point is that the result of such moves will be higher costs for mobile devices with no guarantee of lower service costs. Long-term service contracts do indeed partially include financing charges on the device which you use. As phones get smarter and we use them more to surf the web, send emails and other things, the batteries seem to get smaller. Some tips to get the most out of your battery are to turn off the radios you don't use. WiFi and bluetooth are prime candidates and on an iPhone you can even turn off the 3G network and use EDGE if speed is not so crucial. I had a very interesting day so far. A crying child had me up at 3:30 AM and I didn't get back to sleep. I figured I would take the opportunity to get ahead on my work. So iPhone, a bowl of cereal and coffee in hand I plopped myself in front of the financial news stations to see what the results of the weekend bail out of Freddie and Fannie would be. Shortly after the cereal was done and a few sips into my delicious Elite Coffee, the internet went out.